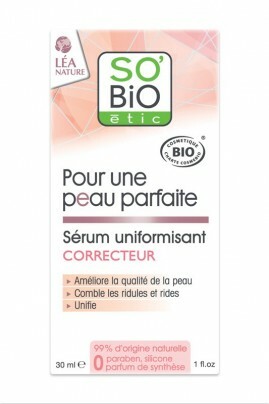 SO BIO ETIC Organic Correcting Serum "Perfecting Skin" instantly evens your skin ! Non comedogenic, its silky soft texture blurs complexion blemishes visibly. This Organic Face Serum transforms the quality of your skin : natural hyaluronic acid smoothes the complexion and plumps fine lines and wrinkles, while Witch Hazel floral water tightens pores for a clean matte finish. Your skin looks even, smooth and soft, (almost) perfect ! Proven efficacy by clinic test from So Bio étic ! Organic Perfecting Skin Serum is the third step to flawless skin ! Apply SO BIO ETIC Skin Perfecting Serum day and/or night, before Perfecting Moisturizing Cream. Layer the serum with your fingertips on face and neck, then smooth lines from the center going outwards. 99% natural correcting serum to blur skin imperfections !